.... Brooks argues that “motive attribution asymmetry” leads people to assume that those with whom they disagree are motivated by hate. 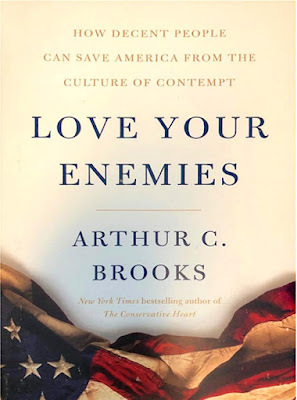 This shuts off the possibility of negotiation and compromise, and breeds contempt, which Brooks defines as a combination of anger and disgust. Contempt, not only for the ideas held by those with whom we disagree, but also, and more significantly, for the people who hold those ideas. The argument Dr. Brooks makes that resonates most strongly with me is first to reject the notion that disagreement is bad. You might be tempted to say we need to find ways to disagree less, but that is incorrect. Disagreement is good because competition is good. Competition lies behind democracy in politics and markets in the economy, which — bounded by the rule of law and morality — bring about excellence. Just as in politics and economics, we need a robust “competition of ideas” — a.k.a. disagreement. Disagreement helps us innovate, improve and find the truth.